As Lotus withdrew from the production side of racing car manufacture there were a number of personnel in the Hethel area of Norfolk looking for new employment. 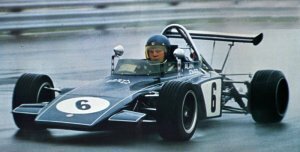 Several of these ex-Lotus employees, notably Mike Warner, designer Dave Baldwin and two leading technicians, Derek Wild and Gordon Huckle formed Group Racing Developments by linking together with local engineering company, Griston. To finish the group Jo Marquart joined from Huron as designer. 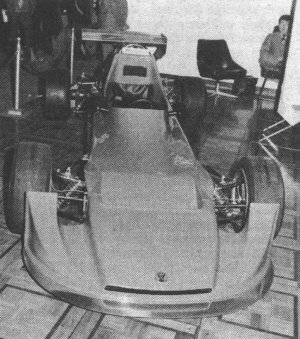 With Lotus, and soon Brabham, leaving the production racing car market things looked good for GRD and initially they had a lot of success and in 1973 joined up with Denys Dobbie's DART operation with grand plans for the future. However Dobbie pulled out in early 1974 and by the end of the year production ceased as prospects for the following year were not good. 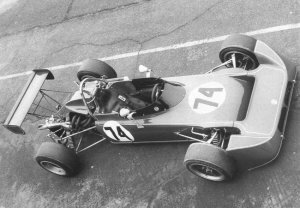 Three former employees set up a service operation and in 1975 Van Diemen took over this and the 375 F3 car (of which a modified version became the Van Diemen F3 car). Alan Jones in the wet at Thruxton in his DART GRD 373. 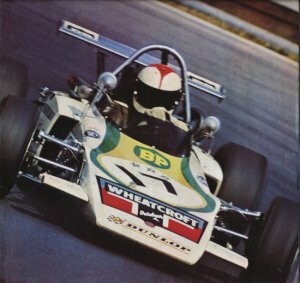 Most of the changes to the 373 were to make production of the chassis easier but it seemed that the factory preoccupation with F2 meant that the F3 car lacked some development and although successful it began to receive a less than flattering press from some of its drivers. A chassis flexing problem was solved mid season but it wasn't until the end of the year that the real hard testing was carried out that eventually cured the problems. Alan Jones, Brian Henton and Richard Robarts chalked up 9 wins between them so the season wasn't a total disaster by any means. radiator and full-width nose come configuration. 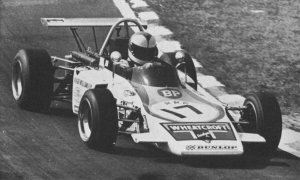 F3 racing was in the doldrums in the UK in 1974 with very small grids so the first major changes to the GRD design didn't really help matters. The chassis/suspension remained basically as before with the changes to the radiator positioning and the new nose being the main modifications. Alex Ribeiro and Pedro Passadore had some reasonable runs but the writing was on the wall for GRD. The GRD 375 at the 1975 Racing Car Show. The first GRD 375 was in fact an updated 374 which shows that once again this was an evolutionary update. Ian Taylor ran in a works version and some support was given to some of the European competitors. The car retained its full width nose but the radiators were moved rearwards again. Highlight of the year was undoubtedly Renzo Zorzi's fortunate victory at Monaco in a 374. At the end of the year GRD closed down and the F3 operation was taken over by Van Diemen. Tim Brise, Tony Brise, Cesare Doneda, Patrick Duchamp, Adelmo Fossati, Johnny Gerber, Bengt Gilhorn, Neil Ginn, Mo Harness, Hans-Peter Hoffman, Alan Jones, Masami Kuwashima, Barrie Maskell, Kurt Müller, Jorge Pinhol, Pierre-Francois Rousselot, Robin Smythe, Fernando Spreafico, Andy Sutcliffe, Keiichi Tahara, Ian Taylor, Bernard Vermilio, Jo Vonlanthen, Roger Williamson. Thomas Betzler, Bernhard Brack, Tony Brise, Wolfgang Bülow, Ingvar Carlsson, Rudolf Dötsch, Harald Ertl, Jeremy Gambs, Alexander Güttes, Sigi Hofmann, Alan Jones, Dieter Kern, Gernot Lamby, Heinz Lange, John MacDonald, Jac Nelleman, Gunnar Nordström, Pedro Passadore, Richard Robarts, Tony Rouff. Tony Brise, Jacques Coulon, Roger Craven, Neil Ginn, Hans-Peter Hoffman, Alan Jones, Richard Knight, Norman Moffett, Jac Nelleman, Masami Kuwashima, Pedro Passadore, Larry Perkins, Rod Smith, Fernando Spreafico. Hakan Alriksson, Alberto Colombo, Gaudenzio Mantova, Gian-Massimo Martoni, Luis Moraes, Marcos Moraes, Jac Nelleman, Pedro Passadore, Alessandro Pessenti-Rossi, Alex Ribeiro, Renzo Zorzi. Bernhard Brack, Günter Hölker, Roger Hurst, John-Erik Johansson, Gernot Lamby, Jac Nelleman, Gunnar Nordström, Tony Rouff, Len Smith. Ingvar Carlsson, Werner Fischer, Den Greer, Shaw Hayami, Donald MacLeod, Jac Nellemann, Ian Taylor. Doug Bassett, Derek Cook, Jac Nellemann, Porky Thyling, Mike Tyrrell, Renzo Zorzi. Hakan Alriksson, Ulf Alriksson, Bernhard Brack, Hans Deffland, Dan Greer, Günter Hölker, Roger Hurst, John-Erik Johansson, John Lain, Anders Olofsson, John Rust, Clas Sigurdsson, Len Smith, Marc Surer, Henrik Spellerberg, Fernando Spreafico. Tommy "Slim" Borgudd, Ingvar Carlsson, Sören Hansen, Stefan Johannsson, John Nielsen, Jan Ridell. Anders Olofsson, John Rust, Rudi Sehr.